Currently planning a family trip to South Korea from the 18th October – 28th October. We are hoping we could enjoy the full Autumn foliage which is anticipated to reached full foliage at the end of October. We will likely to make this trip with the Tham Family, whom can only decide by the end of August to see if they are able to join us for the trip. Currently our intention is to travel on the 18th October (night flght), reaching Seoul early morning on the 18th October. Given that it is a night flight, we are hoping the kids can sleep throughout the flight. From Incheon International Airport, we will need to make our way to the domestic airport (Gimpo Airport) to take a flight to Jeju Island. From the tripadvisor suggestion, we will need at least 3-4 hours in between the flights to ensure sufficient time for transfer. We decided to do this rather then spending a night is Seoul, since this will save us some traveling time to-fro Seoul. Moreover, we have decided to do this, knowing that we should be able to keep our big luggage at storage facility in Gimpo aiport. The flight from Seoul to Jeju will be an hour flight, and we are hoping that we could reach Jeju late morning or early afternoon. We should spend around 3 nights in Jeju, leaving Jeju in late afternoon on the last day in Jeju. With this plan, we are hoping that we should have 2 full days and 2 half day (first and last) to travel around Jeju. With the plan, we will depart Jeju on the 22nd October for Seoul. We will take a late afternoon flight, hoping that we could reached Seoul in the evening, so that we could catch some daylight to make our way Seoul Hotel, which will help us to be oriented with the surrounding in Seoul. We will spend 5 full day in Seoul and will leave on Seoul on the 28th October 2012. Likely to take a afternoon flight (which seems to be the case for all airline), anticipating to reach Changi Airport in the evening / night. Pre-booked Korean Airline which allows reservation to be held till 30th August 2012 (2 months). This is much better then booking from travel agent. Have tried booking from several travel agent, and notice that they only allow you to hold the ticket for 1-2weeks. Booking directly from Korea Airline is $100 cheaper then travel agent. However, it is really difficult to get through the line. Once you get through the airline reservation, it was smooth sailing. Reservation was easy and reservation staff was friendly. Manage to get agent direct email address, which help in future amendments and communication without the need to wait for one hour to get through the line. Seeing that Asiana Airline has better airline quality review as compared to Korean Airline airline quality review, wanted to check out Asiana Airline as well. 1) Resevation can only be held till 20th August. If by 20th August, we have a confirm morning flight to Jeju, we will likely book through Asiana Airline, else we will stick with Korean Airline. Total cost is around $1000 per person, which we thought is a pretty good price. On exploring taking a cheaper international flight and buy a separate ticket to Jeju, we notice that the saving is marginal. Cheaper Option 1: We could take SQ to Seoul ($790) and probably pay around $150 – $200 for Jejuair. With a saving of $50 – $100, per pax, We are flying SQ in the day (bad timing) which potential waste a single day, reaching Seoul at 10pm (this require us to stay in Seoul for 1 night). The cheap flight to Jeju is in the afternoon, therefore, if we to fly to Seoul in the morning, we should spend around $180 – $200 for the flight to Jeju). Therefore, the saving is not worth the hassle. Cheaper Option 2:We could take a non-direct flight e.g Cathay Pacific ($650) and book separate Domestic flight for Jeju. This will give a saving of $100-$200 per pax. However, this will extend our flight time and with 3 children (age 2-4), felt that this is not a very good option. The most work harder and spend less for the next few months. Jeju Accommodation – Ocean Log (Recommended by Steven Ng). Unable to find any review. However, looking at Steven’s facebook photo, the lodge looks present and next to the sea. We felt that the bed and breakfast lodge is very lovely (on picture). Owner charge us W400,000 for 3 nights per room. that is around S$140 per night. Given it is a duplex lodge-chalet, we felt that the price is reasonable. We know that here is very few Singaporean staying in the lodge, as the owner still remembers Steven (the last Singaporean that visited in March / April). Accomodation is 40-50mins drive from Airport. Seoul Accommodation 1 – Hotel Sunbee Ranked 21 in Tripadvisor. Located in Insadong area at a price of W100,000 a night (all in), which is pretty reasonable. Only problem is that it is 10 mins from train station. Seoul Accommodation 1 – At the end, we chosen EO Residences, which was located in Myeongdong. It was cheaper for the family and we thought that it is more accessible to most tourist attraction. Given that it is near Myeongdong, it will allow moms to go late night shopping since the lodge is located very near to Myeongdong shopping area. Price wise, it is cheaper at W75000. Seoul Accommodation 2 – Lotte World Hotel Ranked 8 in Tripadvisor We are thinking of spending the last 2 night in Lotte World Hotel. It will cost us W197,000 per night (Corporate rate) which is around $220 a night. With theme park, Lotte Mart, Shopping Mall & direct Limousine bus to the airport, it is really tempting to indulge to stay 2 night at Lotte World Hotel. Anyhow.. booked 2 rooms while we still deciding if we want to indulge in the 2 nights stay. Got International License from AA Singapore. This is mandatory for driving in Jeju. We got the manager from our Jeju lodge to book a car for us. He got as a Kia Carnival (9 Seater) at $300 for 4 days. Sleep in plane. Got all pillows to bring alone for Jaydon. Transfer from Incheon Airport to Gimpo Airport. If time permits. Load luggages, go Dream Park for Autumn Flower Festival. Night – Volcano show @ Lotte Hotel Jeju every evening (subject to weather) around 8.30pm. Manjang Cave [UNESCO World Heritage] – probably not interesting for kids.. but then again it is world heritage! We could head to Jeju Folks Village where there is a Halla Tangerine Farm nearby. Returning Car & Jeju Airport by 2pm. Take a jumbo cab to accomodation. To be ready for the trip. Me and my wife pick up some korean language from TalktoMeInKorean.com. Felt that the podcast from the site is very lively and both commentators did a great job in helping listener to learn Korean language in a fun and interesting way. Bring 3 young kids to Seoul & Jeju, the greatest concern that we have is their meals. Therefore, to ensure that we are certain of the kids diet and meals in Korea, we brought the kids to authentic Korea Restaurant in Singapore to let them have a taste of Korean food. 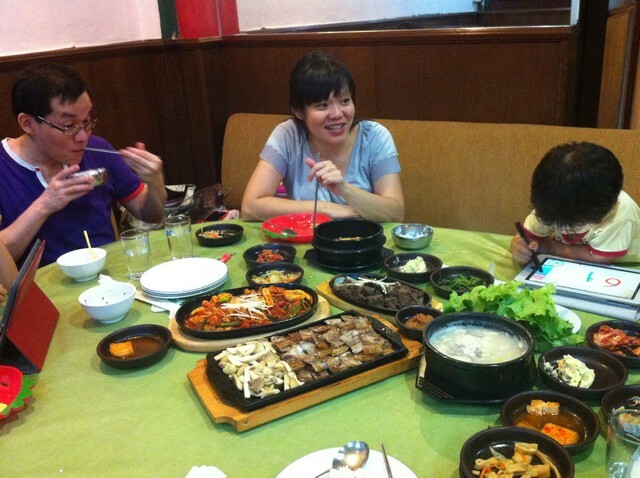 We were pretty glad that the kids are able to adapt to Korean Beef/Pork Soup as well as bulgori beef. One thing we found out is that kids should be able to survive with rice with the korean side dishes, which would usually consist of veg and tofu. Therefore, we conclude that for the Kids, we just need to have a soup base dish + Side Dish, should be sufficient for them. Thanks Sabrina. We will definitely visit this attraction. Thanks! Started blogging since 2006. Main purpose is to retain some memories on the event that happen in our life. You should start too! Not for others, but for your own memory. Hi, I am planning a trip to Seoul and Jeju with my now 13mo daughter and husband this Oct 18-28. Thanks to your blog, I can now plan my itinerary accordingly. I love the place you stay in Jeju and thinking to stay there but I cant read their website. Do you mind to share how you booked this pension? Thanks! He is probably in his 30s and could communicate in English (simple). Hi I managed to book the pension. Thanks so much for sharing!